If you want to create a better blog you need to focus on excellent content creation. In fact, Panda algorithm update, one of Google’s methods of tracking websites, may detect poor content and punish them by lowering organic traffic. Also, creating a blog that works is so much more than strategically placing a plethora of keywords in order to increase website traffic. After Penguin, every smart webmaster needs to abandon bad SEO habits, like too aggressive positioning techniques. Basically, Google goal is to improve user experience, rewarding original and quality content. So, you need to find a way to write blog posts specially built for the readers and for the search engines. Free Download: I have already written a 4000+ word easy-to-follow guide on the topic on page SEO techniques that will help you get higher rankings instantly. Feel free to download the 23 point SEO checklist using the link below! ➜ Click Here To Download! 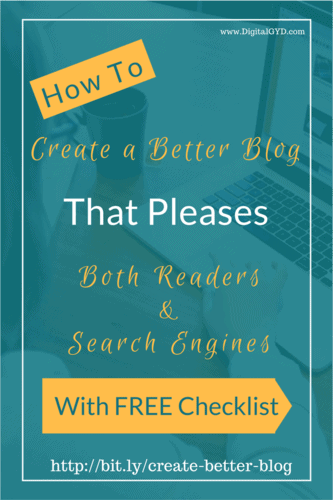 This article will help you find out how to create a better blog to please both users and search engines. Conclusion: How TO Write For Users and Search Engines Alike? Content creation must come first, in order for your website to establish authority. Misinformation, plagiarism, poor grammar, punctuation, and shoddy paragraphs will significantly reduce one’s credibility and ethos. You need to write excellent content to let readers find your website, stay on the page and then return later to read more great information. Here is a list of some essential content creation tools, handy printable grammar cheat sheet PDF (for that quick vocabulary/grammar confusion clearance we all face) and best plagiarism checker tools for you to use. So what kind of content will attract readers, and turn visitors into customers? A blog should have a takeaway aspect for readers. Provide information that will enlighten, inform, or inspire. If your website is writing-related, provide some tips to create a better blog, for example. Book, movie, music, or web reviews are effective ways to inform your readers. Are you an avid reader, film reviewer, or music buff? You can write reviews on your website. You can include an inspirational movie quote like Robin Williams Quotes or feature a new word of the day. Share a recipe that worked well, or amuse your readers with a recipe that didn’t go well. Have lists for readers. Are you a trivia person? Share an interesting fact. If you are not feeling creative, you can overcome writer’s block by inviting an expert to be a guest blogger on your website. Adding graphics and photographs will enhance your content. There are people who can write a lot in less time and in the middle of confusion and people who need a calm place, without distractions and a few hours to create a good article. Whatever is the level of your ability, consider that your writing skill will improve with time! Find your compromise : check in which condition you are more productive. This is the most important thing, your productivity! Get a PC without an internet connection where you can write and create new content (or switch off momentarily the internet connection of your main PC). How to stay motivated to write even if you have no readers. 15+ essential content creation tools you need to use right now. 5 books every writer/blogger must read. You have the option between targeting high traffic keywords with huge competition or else looking for long-tail keywords with very low competition. Whatever you choose, Google Keyword Tool is an excellent method of finding out keyword statistics. Here is how you can use it Google Keyword Planner for SEO. While long-tail keywords may not get you as much traffic as popular ones, you’re likely to have a far better return on investment. To get the most out of competitive keywords, you’ll need to spend a small fortune in order to be seen ahead of other companies. With long-tail keywords, expect your conversion rate to be higher and your expenditure to be lower. Some of the world’s most lucrative websites only get moderate traffic but have an exceptional conversion rate. Do you know that LSI keywords can help your content rank faster? It is also worth noting that research shows four-word queries lead to the highest conversion rates (for example, “create a better blog“). Your blog should be well-indexed to the point where you can utilize any number of four-word keywords that are relevant to your industry. Here is a video tutorial about how SEMrush eases your task of keyword hunting and gives you access to millions of untouched, easy-to-rank keywords. Get personalized SEO and content ideas when you link your analytics and search console to it. You don’t have to shell a penny for this! Use this SEMrush 30 day free trial coupon to get the best of SEMrush while it’s all free. P.S. Download this handy SEMrush tutorial worksheet so that you don’t forget anything. Long Tail Pro – To find long tail keywords that have low competition. SEMrush – To find what keywords your competitors are ranking for and then targeting those keywords. The headline is the most important part of your article, because it is the first thing the users see before deciding whether to read your content or discard it. But be careful! Do not promise things that do not respect the content of your article, otherwise you will lose credibility. And you know how important is the online reputation for bloggers and writers. It’s important to remember that search engines read your blog’s code directly when they are indexing the site. Most blogging platforms are built in a manner that ensures the title of your posts is the first thing seen by search engines thus making these titles the most important element of blogging. When it comes to search engine optimization, you must have the most relevant keyword in the title. In order to be effective, you will need to consider your target audience and what they might type into the search box in order to find out more information about your industry. The trick is to include keywords without making the title sound odd. It’s best to focus on one or two keywords at most in each post as this is not only great for SEO, but it also makes it easier to write coherent content. the anchor text of internal and external links. Actionable ON Page SEO Guide You Shouldn’t Miss! Essential WordPress SEO plugins for your blog. Essential things to do before publishing a blog post. How to use Grammarly to optimize your blogs with proper grammar and zero duplicate content. Outbound links to related pages is a relevancy signal that helps Google finds out your page’s topic. A recent study found pages with outbound links outrank pages without outbound links. Of course, blog posts that have been linked to is likely to have more authority than those without links. The most value is gained via inbound links from sites that are already deemed to be an authority in your industry. All incoming links are worth something in the eyes of search engines, but a mention from a big website may be worth thousand links from small sites. Internal linking is important too. Be sure to link to previous posts using relevant keywords as a means of improving credibility along with search engine ranking. However, you should only have a handful of links in any single page. The average reader hates reading a page filled with links as there is the possibility that one of these links will accidentally be clicked on. Additionally, search engines tend to penalize websites that overindulge in links. Backlinks SEO: What Are Backlinks? 10 tips to build backlinks safely. How to use controversial blog posts to get more PR and links. How to increase the Google ranking of your blog. To create a better blog you need to work on branding too, which involves building awesome content, but also creating a catchy logo. stimulating: give people food for thought, the sight of your logo. The only limit that separates you from the realization of a logo is given by your imagination. But what’s the best way to get your logo designed? Luckily, there are a plethora of options today from logo generators to freelance designers, design contests, and design agencies. If you do not have the budget to hire someone, you can create a logo yourself using drag and drop tools like stencil. The logo of my blog DigitalGYD is also made by the same tool. You’ll agree it is a decent work by a non-designer like me. How to brand your blog’s Twitter handle. How to brand your blog on Facebook. How to boost your domain authority (DA) and page authority (PA). Social Warfare: The most light-weight (& clean-coded) social share buttons with click-to-tweet features, you can also set custom vertical image for Pinterest shares without uploading them to your blog. Check out its features here. 9 easy ways to get maximum Facebook shares. 10 ways to get more Pinterest traffic & Pinterest shares. Once you have created quality content, it’s time to share it! This is another important part of having a successful website. You can have a fantastic website, but it will not be useful if people cannot find it. Remember learning to share when you were a kid? This is just the same. I like to compare being ranked in the Search Engines as a high school popularity contest. You need to hang out with the “cool” or “powerful” kids, look and dress nice, present yourself well, join clubs, and be “popular”, thus creating a conversation about yourself. Doing so will help you build authority on individual pages and eventually your domain as a whole. It’s all about content, and sharing that content throughout the web-o-sphere! Now that you have a few ideas about building a better blog, like excellent content creation or post optimization, you are well on your way to effective writing for SEO and users. Yes, of course, search engines are important. But your readers are even more important! Consider that the content will be read by real people, not just robots. Get your FREE trial of SEMrush (you don’t need to buy it). Analyze what keywords your site is ranking, what are the top posts on your site but are still not able to get the limelight of Google’s first page. Then extract the keywords which are bringing you more traffic. Head over to your blog to optimize them even better. I hope you have enjoyed reading this small guide to build a better blog. If you have any other suggestions or you would like to leave your thoughts, please use the comment form below, thanks! And don’t forget to share the post, if you liked it! This is a guest post by Erik Emanuelli of NoPassiveIncome.com. Great tips on how to create a better blog. I am always looking for tips that I can use to improve my content. After all without great content, the chances of it getting shared and more eyeballs on it decrease. I totally agree with you the days of keyword stuffing are long gone. Now I choose to focus on targetting long tail keywords instead of trying to get my blog ranked on high competitive keywords. I really don’t focus too much on link building. I know this is one of the tasks that I need to improve on. There’s just so much to do, I’d rather spend my time on other things that seem to be helping me build my blog. Whenever I sit down to write a blog post, I always try to make it as informative as possible. I’ve never heard of inserting an inspirational movie quote, I’ll have to check that out. Thanks for providing these tips, they’ll definitely help me create a better blog. Wow what a great detailed list – I feel that although I already know what I need to be doing it always helps to see it laid out like this and get some detailed reminders from the pros! Well done. Great post, with a ton of information! Thanks for the specific information and great printable to help me remember! These are great tips. I need to spend some time learning more about SEO. Way to be unstoppable on your blog journey. Great post. Cheers! This post was so very helpful. Thank you for all the great recommendations. Great article. If I use your ideas in an upcoming post, I’ll link to you. I also have a post planned on this topic. Thanks for these reminders. I am going to definitely come back and use your recommendations. Great job! Great tips! This is the balance I am always trying to achieve with my business clients whom I do copy write for–getting the search engine’s attention through keywords, while keeping the user on the website once there, through excellent, helpful information. These tips are spot on. Thank you. Excellent advice. SEO is a long-term strategy. I have old posts that still bring in a ton of traffic seasonally. It’s so motivating to make sure content has longevity. As always, great tips that are easy to follow and understand! Thank you! This is such a great post. Yes the SEO is very important. And the most is the quality. Because not having these two your blog is just dead. This post is jam packed with so much useful information! I’ll have to bookmark it to come back. I’d like to look at the other links you’ve a included. Thank you for all this great information on how to improve blog posts. Keywords are so important for SEO! Awesome ideas. I’m working on making my blog easier to read, so I will keep this in mind. I also want to always build my brand! Really helpful tips. I am currently not where I want to be in terms of branding for my blog but I guess with time I would figure it out. I have been using Yoast recently and it really helps me to ensure my blog posts are web ready. Some of the other things I am learning along the way. These are all great tips. Many of these items I am able to achieve with using plugins. Great read! Thank you for the tips specially the Google keyword tool. I wasn’t aware of that before. Please post more of this to helo fellow bloggers. ? Thank you for sharing these tips! I read a lot of blog promotion posts that focus so much on SEO that they forget to mention good writing. I focus the majority of my limited time and energy on the content of my posts, and work in the other concepts where I can. These are all such great tips. I’m definitely going to start thinking more about outbound links and linking to previously published conent in posts. This is some great information. I need to look more into SEO, I think it is not so great, but your tips were very helpful! These are incredible tips for bloggers like myself! I’m unfamiliar with the Google keyword tool, but I’m going to check it out! Great article. Thanks for sharing this. Very useful information. I will surely apply your tips in my blog. I love the tip about the google keyword tool. Great tips – I am working on putting more long tail keywords in my posts! A blog should have a takeaway aspect for readers. Provide information that will enlighten, inform, or inspire – Great tip. Thanks! These are really great tips and I will certainly keep these things in mind. This information is so great. Im actually working on this in my blog this month. Thanks!! Turning off the wifi is such an amazing little trick! I’m so glad you mentioned this. When the wifi is on, my computer bings and dings and I have to run and read emails, watch cat videos and plan my next vacation. Productivity drops radically. I find using SEO (such as a plugin,etc.) should be viewed as a guide and not your main goal of the post. At least with me, that is what I aim for. Getting caught up in all the little details it’s easy to miss the big picture. Thank you for your content, I really enjoyed this article! What an informative article! I love your tip about the Google Keyword Tool, thanks for sharing that! Thanks for these tips! It is really tough to keep readers engaged. This is a great post. Packed full of useful information! Thank you so much for sharing. I feel like my keywords really need some help. I know that I am going to check out this app to help me a little bit. I think I just get lost in what I’m writing that I don’t really optimize and I know that’s hurting me right now. Thanks for the excellent Tips ! Well, I personally focus on building in-depth but point to point content which can help users solving their queries and that content is good enough for search engines. I do not generally focus on small points as I know only one thing that my content is for my readers help and that’s it. Writing is very rewarding, but sometimes our work doesn’t meet our expectations. We’re always seeking perfection, and we can be so hard on ourselves. Brushing up on the basics of grammar and spelling is a must for any writer. We need to spend some time learning the correct uses of punctuation and basic rules for written English. There is no better way to get better at writing than to practice. Content strategy should seek to produce and distribute content that is consistently shared by our audience, but that also can be shared easily. Creating a steady stream of fresh information on a variety of topics opens several avenues to drive traffic to a website through search, social media, traditional media and more which ultimately results in phone calls, orders or foot traffic. Eventually, thanks for sharing your healthy ideology regarding this subject. good to see you at Swadhin’s place and thanks for taking the time to read my contribution. If you are taking blogging seriously, it’s all about having a plan, which also means understanding your audience and knowing what kind of content they want to read. There are plenty of opportunities on the internet and blogging can be a profitable business.